Today in Masonic History Pierre-Théodore Verhaegen is born in 1796. Pierre-Théodore Verhaegen was a Belgian attorney and politician. Verhaegen was born in Brussels on September 5th, 1796. He was part of a family of Catholic lawyers. At the time he was growing up Belgium was incorporated by France. He attended a school that was established by Napoleon I of France. When he was 19 the Dutch replaced France as the predominant culture in Belgium. It was at this time that Verhaegen became a lawyer. His first case involved three priests who were accused of being disobedient to the regime of William I of the Netherlands. 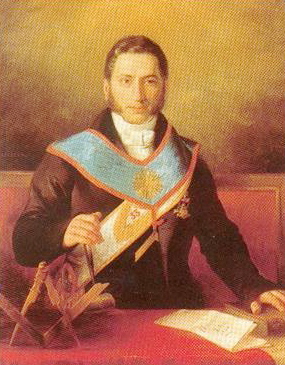 In 1823, Verhaegen joined the masonic lodge Lodge L'Espérance whose Worshipful Master was the Prince of Orange, the future King William II of the Netherlands. Joining the lodge had a profound effect on Verhaegen and would eventually lead him to be named the burgomaster, a political leader of a region, of Watermaal-Bosvoorde. In 1830 when the Belgian Revolution came, Verhaegen worked to ensure that Bosvoorde remained calm. After the Belgian state was established Verhaegen tried to convince his fellow masons that they should play a larger role in the politics of the country. This created opposition in the Grand Orient of Belgium and in other masonic organizations around the world. Verhaegen felt that the progressive ideas that Freemasonry brought to the table would help the newly formed Belgian state. After seeing that he would not be able to form a political party from the Freemasons in the country, Verhaegen turned his attention to creating the first liberal party in the country. He served in Parliament from 1836 to 1859. Verhaegen was also a monarchist and believed in limited voting rights. He also opposed a general learning duty. This was mostly because at the time, catholic schools had a monopoly on schools and he felt that would enable the schools to profit. As a child of the Enlightenment, Verhaegen believed that the progress of humanity would eventually lead to a general prosperity. Verhaegen was strongly anticlerical and yet was a devout Catholic. He believed that the place for the priests was in the church, not in the political arena. Publicly he declared himself a Catholic and attended church every Sunday. This frustrated many of his political opponents who tried to find an avenue of attack on him politically. Verhaegen donated money to build several churches in Belgium. Verhaegen passed away on December 8th, 1862. Verhaegen was the Worshipful Master of Les Amis Philanthropes lodge in Brussels. He was also the Most Worshipful Grand Master of the Grand Orient of Belgium from 1854 to 1862.